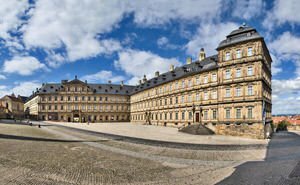 The new residence in the historic German town of Bamberg is an impressive and intriguing complex that replaced in the 17th-18th century an old residence of prince-bishops of Bamberg. Today, this massive building, built of sandstone, acts as a state library, and there you can also see the National Gallery of Bamberg. Bamberg town itself is one of several cities that was untouched by the bombing during World War II and thanks to which today you can be see the unique historical buildings that have been preserved in very good condition. The new residence in Bamberg was built with four wings, they were built in two stages. The first two appears in the Renaissance style, which was built during the reign of Prince Bishop Johann Philipp von Gebsattel in 1602. The imposing sandstone building of the residence borders both sides of the new cathedral square in Bamberg. The Prince Bishops of Bamberg lived and governed there until 1802. Prince Bishop of Bamberg governed and lived there until 1802. Between 1697 and 1703 the Franconian Baroque palace was also built. This is under the patronage of Prince Bishop Lothar Franz von Schönborn, which assigns the task to the architect - Johann Leohnard Dietzenhofer. The construction master brings two new wings of the residence of the prince-bishops in Bamberg, overlooking the Cathedral Square, by linking them with the old parts of the complex from the rear side. Many believe that the only more impressive facade is the interior decoration of the new residence in Bamberg. There are over 500 pieces of authentic furniture including tables, chairs, sofas and armchairs all dating from the 17th and 18th century and can be seen in more than 40 rooms and halls that are currently open for public visits. Impressive are the ceilings of most rooms, which are a genuine work of art. The Imperial Hall is something that has no equivalent in any other palace. It has a relatively low ceiling, because it is built on the first level of the new residence. The decoration of the ceiling was made of a Tyrolean master named Melchior Steidl, who took the task to create the illusion of space. For two years between 1707 and 1709 the artist painted his brilliant work, allegorical images representing the German emperors, intertwined with different seasons, which created a genuine triumphant march across the sky. For one of the biggest values of the Hall of Emperors is considered the massive curtains of Beauvais which made around 1730. The Rose Garden at the new residence of the prince-bishops in Bamberg is a genuine piece of paradise. It offers a magnificent view over the city. The Rose Park is divided into four parts with crossed paths in the middle. There also was erected and a lovely oval fountain. More than 4500 rose bushes bloom in the gardens of the residence during the summer months. The garden has a pavilion, designed by Balthasar Neumann which was completed in 1757. Today it has become a pleasant coffee shop which also offers a huge selection of delicious cakes.